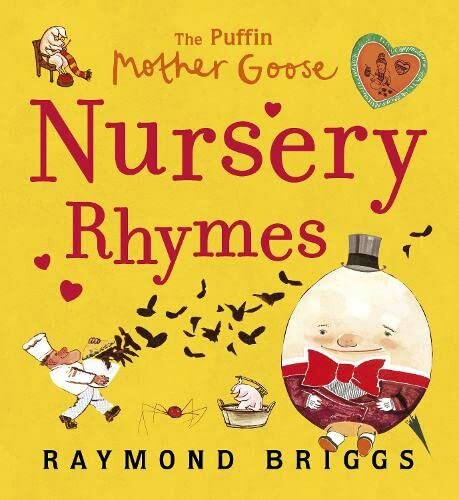 Not suitable for children under 2 years 6 months of ageTaken from Raymond Briggs' classic "Puffin Mother Goose Treasury", this is a perfect first introduction to everyone's favourite nursery rhymes. This title includes beautiful illustrations throughout by the much-loved creator of "The Snowman". Raymond Briggs is one of our most respected and beloved artists. Born in Wimbledon Park in 1934, he studied at the Wimbledon School of Art and later at the Slade School of Fine Art, and went on to produce a treasure trove of work. He has created characters that are now icons for generations of children, including Fungus the Bogeyman, Father Christmas and, of course, the beloved Snowman. The biography of his parents in graphic novel form, Ethel & Ernest, became a bestseller in the UK, and an animated feature film based on the novel will be released in 2016.He has won many awards over his career including the Kurt Maschler Award, The Children's Book of the Year, Dutch Silver Pen Award, and the prestigious Kate Greenaway Award twice for his Mother Goose Nursery Treasury and Father Christmas. Raymond lives in Sussex.